Who our God is and how He works cannot be captured or contained. Our God is extreme. Our God is unstoppable, unfathomable, and untamable. Our God is wild. It is He Himself who is beckoning us to pursue Him beyond our circumstances, beyond our emotions, and beyond our logic into the glorious mystery that is Him. Offering miraculous, inspiring stories of lives and circumstances transformed by the Holy Spirit, author and speaker Kim Meeder shows that God isn't calling us to fully understand Him; He is calling us to fully trust Him. Through everyday practical ways, Kim encourages readers to pursue Him more passionately and to trust Him more fiercely. The wild beauty and glory of our God are calling. And in this hallowed, thrilling place, we will see His face reflected in the miraculous—and we will experience the limitless nature of our wild God. "God is present in these pages. Read them and be invited to the wildest adventure of all--living moment by moment in partnership with the most wonderful Person you will ever know." "Kim Meeder inspires us to believe and follow the God who transcends our limits and calls us to venture forward with the confidence of knowing that He has our best interests in mind." True beauty has nothing to do with how you look—but how you live. Journey with gifted storyteller Kim Meeder as she encourages women to see that true value is defined by our Creator and our worth has a purpose of eternal proportions. Real beauty isn’t a “look,” it’s an action. Beauty is forged by making one life defining choice—to lay down personal ambitions and selfish desires, pick up your sword of encouragement, and fight for those around you who are losing their battle for hope. From this fierce furnace pours lasting value, fulfillment, and joy, the template of a beautiful heart. 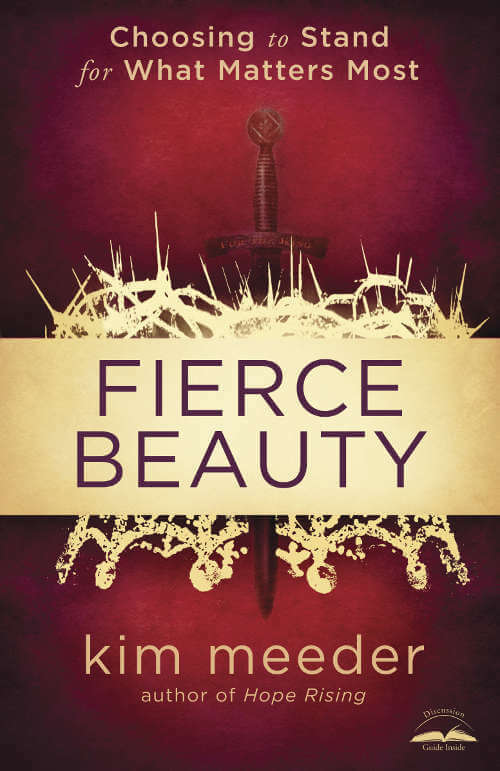 In Fierce Beauty, Kim shares inspiring true stories from her own life of adventure, love, and loss, her struggles with self-acceptance, knowing God, and what it means to truly stand for Him. Discover life lessons about trust, transformation, surrender, forgiveness, and genuine purpose. "Kim Meeder poured her heart onto these pages, encouraging readers to be authentic, to defend their hearts against sin, and to find peace in unexpected places. In Fierce Beauty you will be challenged to embrace God's unconditional love when faced with roadblocks. Kim's words will inspire you to stand up and run your own race -- straight into the open arms of Jesus. This book stands alone for self-study, and it would be an outstanding choice for your small group." "Kim Meeder knows firsthand the courageous heart adventure of healing. Fierce Beauty will empower you to recognize your surrendur to the King as the most powerful road to purpose, strength, and beauty." 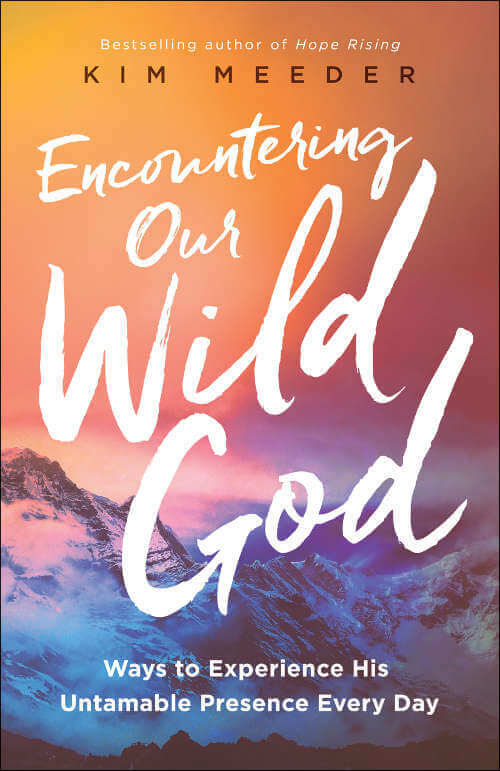 "In Fierce Beauty, Kim Meeder recounts lessons learned through her own journey and awareness of God all around her. Her words will open your heart to receive and embrace truth from God's Word that is able to set even the most captive heart free. I was challenged and encouraged and am certain you will be too!" An inspiring true story told through the vibrant voice of Kim Meeder of an unwanted dog, an emotional rescue and two lives redeemed. Laurie's dreams had been shattered before she came to work at Crystal Peaks Youth Ranch—where broken horses and broken children encounter healing hope every day. Attempting to soothe her own aching soul, Laurie saved a dog in need and soon realized that the dog was rescuing her. Blind Hope shares poignant life lessons Laurie experienced from her ailing, yet courageous canine friend. Despite the blindness of her dog—and her own heart—Laurie uncovered what she needed most: authentic love, unconditional trust, and true acceptance, faults and all. Laurie and her dog, Mia, both learned to follow the lead of a master they couldn’t see with their eyes. In the process, Laurie discovered the transforming power of God’s grace even for imperfect and selfish people. And through her brokenness, she experienced the greatest love she’d ever encountered. "The human-animal bond is a special connection. Kim Meeder highlights this in Blind Hope as she draws parallels between each of us and our Savior , Jesus Christ. As Kim says, 'To trust, listen and believe takes time and practice.' She surely knows how to portray an important message of salvation while entertaining and showing life lessons with Laurie and Mia." "With humorous poignant asides, Meeder beautifully bridges the gap between the sad and the silly, showing the lovely and forsaken aspects of the individual heart so powerfully that readers will be coaxed into revisiting their understanding of the rescue God readily offers to all." "On her ranch in Oregon, Kim Meeder brings wounded horses and broken kids together and sees healing miracles on a regular basis. 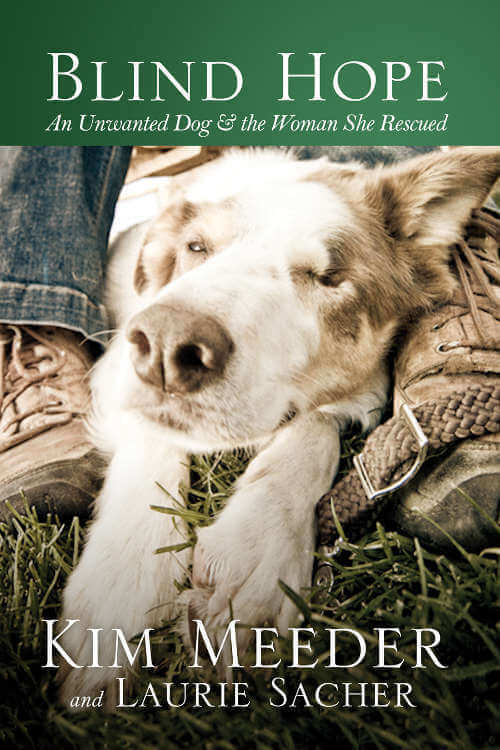 Blind Hope, a wonderful analogy of how God sees and loves his children, shows how a blind and ill dog named Mia helped to bring healing, love, and acceptance to the young woman who rescued her. Laurie's statement 'My dog is blind...and now I see' is the story of all of us. This book could change your life." Stars always fill the night sky, yet they shine the brightest within the blackest of nights. Hope is like that. It resembles the dawn, regardless of what we face, it always rises anew. Hope is for everyone, including you. "Kim Meeder vibrantly shares --and lives-- and lives an amazing story of hope and restoration. A triumph of recovery for wounded hearts!" "Kim Meeder proves that even in our fallen world, hope is not lost. Despite horrific pasts and deep pain, God's mercy is shown true as wounds are healed and hope is restored." "As in her debut novel, Hope Rising, Kim Meeder again shares with us the blessings of hope fulfilled. 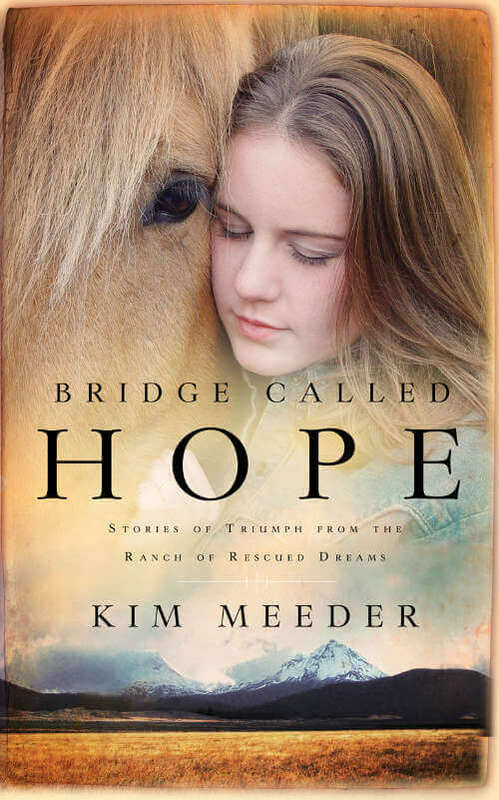 In Bridge Called Hope, Kim uses her inimitable gift of storytelling to transport us to the world of Crystal Peaks Youth Ranch -- a place where the flames of hope of reignited, broken lives find healing, and mountains are moved. Stirring, encouraging and inspirational, Bridge Called Hope reminds us that hope is heaven sent for everyone, and that we, too, can make a positive difference in others' lives." Kim Meeder encourages us to follow a horse where no one else can tread, through the minefield of pain that surrounds a broken child’s soul. From a mistreated horse to an emotionally starved child and back again, a torrent of love revives their barren places. In the presence of unconditional love, a mute girl speaks for the first time. A defiant teenager teaches a horse to trust again, and in the process, opens his own heart to love. A rescued horse gives a dying man his last wish. A battered girl finds love and protection in the friendship of a battered horse. Come visit a place where the impossible flourishes, where dreams survive the inferno of reality, where wounded spirits break the chains of the past and run free. Crystal Peaks Youth Ranch is a place where all that He is—love, joy, peace—is moving. It is a place of His hope rising. "I love good stories, and these are among the very best. Kim Meeder writes with a mesmerizing, wonderfully refreshing beauty. If your soul needs a fresh touch, reading this book is like opening a door and welcoming hope inside." "Wonderful...Exhilarating...Inspirational... Kim Meeder captures that special bond between humans and horses, telling us why it's the little things that make each day worth living." 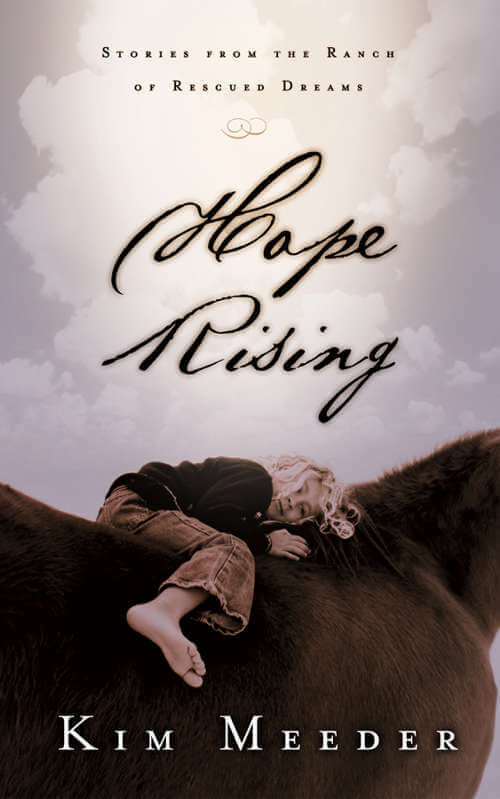 "Hope Rising details the amazing accounts from a special ranch that I have been privileged to support. These memorable stories will touch you deeply."